Arctotis is one of several genus of plants that commonly go by the name of African Daisy. Osteospermum, Dimorphotheca and Gerberas are some other plants that are often called African Daisies. 3"-4", intensely colored flowers with bright, contrasting centers. and is usually coated with soft, downy silver hairs. and may refuse to open fully on overcast days. where they will bloom constantly until the first frost. but the foliage will remain robust and beautiful. Your African Daisy will bloom again as temperatures moderate in the fall. Arctotis are excellent plants for a dramatic border, Rock Gardens, or in small groups. They are very well suited for growing in containers as well. 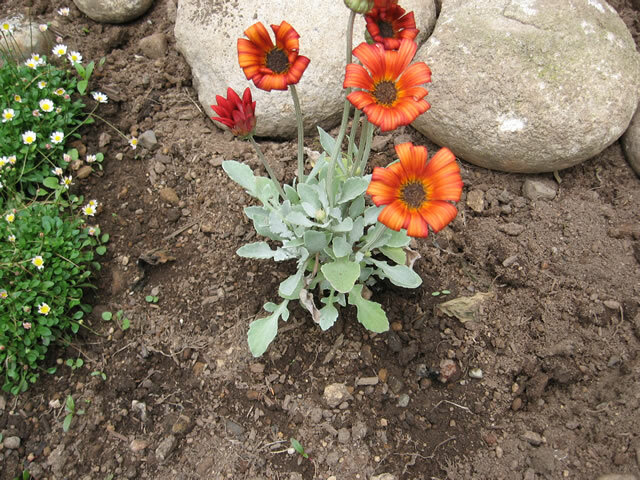 Hybrid Arctotis, Arctotis hybrida, have been developed that have 3"-3½" flowers in a wider range of colors and will open wider in dreary weater. They are vigorous growers that have light silvery green, wavy edged leaves that are heavily felted on the underside. These clump form plants will grow to a height and spread of 18". Cape Daisies, Arctotis fastuosa, form large clumps that will grow to 24" tall. They have large, 4", intensely orange flowers with dark purple centers and purple blotches at the base of each petal. The 5", silvery green leaves are deeply lobed. Blue Eyed African DaisiesArctotis venusta (fka: A. stoechadifolia) grow up to 2 ft. tall. They produce 3"-3½" flowers in shades of white, pink or orange with golden center ring and a bluish grey center. The underside of the flower petals are usually red. The light green foliage has fine hairs covering the top and thick, white hairs on the underside. African Daisies require full sun for optimum blooming. They should be planted 12" apart in light, sandy, well draining soil. Deadhead spent flowers regularly to prolong blooming. Allow the soil to dry before watering moderately. 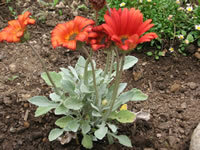 Once established, Arctotis are fairly drought tolerant plants. African Daisy plants can be easily propagated with softwood cuttings taken at any time of the year. Sow African Daisy seeds directly into the garden in early spring, or start them indoors 6-8 weeks before the date of your last killing frost. 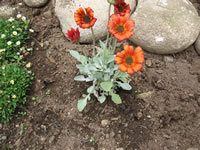 The seeds should covered lightly with fine soil or growing mix. Seeds started indoors should be kept at a temperature of 60°-70° within the growing medium. Germination will take from 21-35 days.